A Jangle Pop Christmas | Pop That Goes Crunch! Music has the ability to blow you away. Sometimes, its fun. Sometimes, its meaningful. Sometimes, its surprising. I decided to listen to a Christmas album during my afternoon commute. It wasn’t your typical Christmas album. It wasn’t sweet or sentimental or traditional. It wasn’t the kind of stuff that pop radio stations play over-and-over again in December. In fact, “under the influence” is the perfect title. The album is “influenced” by Christmas. But it is in all respects a rock and roll album that just happens to contain eleven Christmas songs, some traditional, some not. 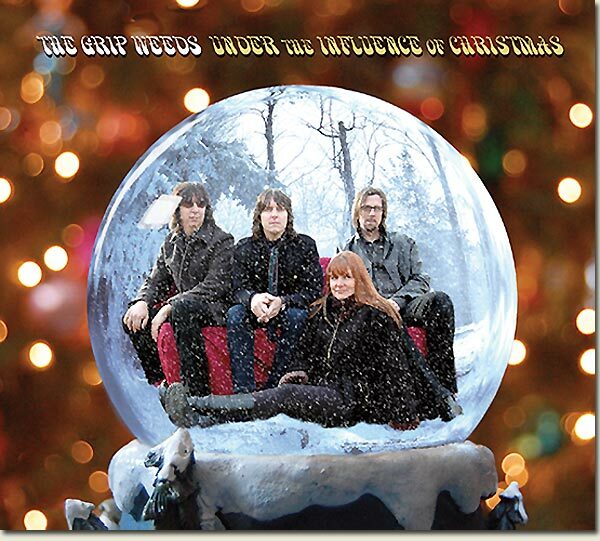 All are done in the Grip Weeds’ signature rocking, slightly psychedelic, jangle pop style. The album gets off to a great start with “Christmas Dream,” which just happens to be “The Coolest Song In The World This Week'” on Little Steven’s Underground Garage. Grand and soaring, it’s reminiscent of “Speed Of Life,” which kicked off their 2010 double-CD Strange Change Machine. The Pretenders’ “2000 Miles,” with its wistful “it must be Christmastime” plea, gets the full jangle treatment, with guitar assists from Pat Dinizio and Jim Babjak of the Smithereens. “Merry Christmas All” is a bit of 60’s West Coast sunshine pop about that “very good time of the year.” And so it is. The band gets (somewhat) traditional on “God Rest Ye Merry Gentlemen” and “Hark The Herald Angels Sing.” The former gets a driving guitar and swirling organs. The latter is anchored by a beautiful Rickenbacker guitar. Both have gorgeous harmonies. It all ends with a rockin’ version of “Welcome Christmas” from none other than How The Grinch Stole Christmas. Oh, and for good measure, they even cover Jethro Tull and Emerson Lake & Palmer. Under The Influence Of Christmas (sound clips of the entire set can be heard here) is simply the best Christmas album I have heard. Ever.